She is the present world number 3 at the WSSA World Ranking. She may be quiet, but she’s none the less talented. Her speciality? Compasses… extensions and evolutions, of which she makes the most in every possible way. What is your vision of freestyle-slalom? For me style-slalom is like dancing. Today, there are different styles of skating developing very quickly, and while some skaters will combine dance with acrobatics elements, some others will integrate more plastic and stylish elements, others will be more dynamical... And everyone have their own unique style. Well, my first competition was in 2004, so I’ve been freestyle-slalom skating for 5-6 years) I don't remember exactly. Influences: Did you train alone, with other people (emulation)? What was the role of the media in your training? I’ve been training alone in a skatepark for a long time, at first. Sometimes, someone came and explained me new tricks and I worked on them. Then of course, once I’d started to skate with all the skaters I improved much faster – when you skate with someone, it’s easier and faster to learn and work on new tricks. Then someone (Andrey) began to coach me more seriously, every weekend. He showed me new tricks and thanks to him I participated to my first competition. When I just started to skate, he gave me a CD with videos of Team Russia members skating, I looked and thought – “My God, I'll never be able to do that, I don't even understand what they are doing)))” It was the biggest stimulus for trainings! What are the key-moments in your evolution? In 2004, after a year of training I took part in my first competition. During my first run I forgot my program – it was awful))) but my second run was ok and I got the third place after Rekil and Kommucap! (4 years ago there were not enough girls for the qualifications and I had to skate with the boys). Since 2007 I have had a new sponsor. Now I'm in the Seba-Team). It's a new step in my skating: I’m starting to be more technical. And it's perfect to be in a team with the best skaters! Of course! First it is travels: in 4 years I’ve been in many countries and cities, it is very interesting and amazing). Thanks to skating I have many friends in other countries. Thanks to skating, I got my perfect job. And chatting with foreign skaters enables me to practice my English). Titles you are proud of? All titles are very different and all are very important for me. And of course, there’s also my 1st place at the 2008 Hannover Inline Games. This weekend was just perfect)) I liked the friendly atmosphere at the competitions, the team-battle and competitions in general were very funny and interesting. 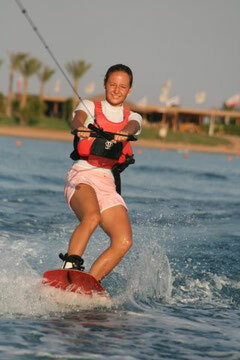 You compete in both Individual and Battle, two different specialties of freestyle slalom. What do you personally get from this diversity of practice? Any preferences? Well, Battle and Individual are two different things for me. And both of them have strong points). In individual, you can create an interesting program to music, special moments and elements. It's very interesting on the one hand, but on the other hand it's very difficult, because you have to skate to music and you have to make your program unique. In battle you can do whatever you want). The best way of skating being: doing more and more difficult and interesting tricks). I like the idea of a best-trick - it's really interesting. And one more plus: in battle, skating is more dynamic, more interesting for the public and less stressing for the skaters… because it's less official than individual program for me, more funny and friendly, I think. What aspects do you like best in slalom? What are you favourite kinds of tricks, and why? My nightmare is wheeling tricks! I don't know why, but I really don’t manage))) and it takes me too much time to train on every wheeling trick. So, my next aim is doing wheeling spins at last… and more) but to get good results I have to train hard. I'm a child instructor: I'm working in the skatepark and Park of Victory for the Federation of Rollersport, and also in WorldClass – one of the best fitness-center in Moscow. I’m working with kids from 3 years-old and older, 4-5 days a week – depending on the number of lessons. And I really love it! Working with children is very very difficult, because you have to make your lessons interesting for them. If your training is boring, the child won’t feel like skating with you the next time. All your trainings have to be made up of games, which helps to understand how to skate) It's more difficult than training with adults, but more interesting. This year one of my little kids took part in the style-slalom competition for beginners... and it was so emotional for me))) I was more stressed than if it had been me taking part in the competition. Snowboarding during winter, and windsurfing during summer).